23 Hour Plumbing are your electric hot water heater experts. Contact us anytime of the day or night for the supply, installation, repair or replacement of your electric hot water system with an Ahs plumbing service available, including all weekends and public holidays. Our fully qualified plumbing professionals cover all metropolitan areas of Adelaide, Melbourne, Perth, Brisbane, Sydney and Canberra to ensure you are never left without hot water again. NO HOT WATER FROM YOUR ELECTRIC HOT WATER HEATER? Should your current electric hot water unit fail to impress and suddenly provide you with a stream of cold water when you turn on the hot tap call 23 Hour Plumbing in the first instant. In many cases a simple repair or part replacement is all that may be required to get your shower hot and steaming again. Should the issue be more prevalent such as a corroded hot water storage tank then a replacement hot water heater will be required. Never fear – your 23 Hour plumber can supply you with a replacement system generally on the same day that you make your booking. 23 Hour Plumbing can assist to determine if a new alternative fuel source replacement hot water heater is required over a replacement electric system – or you can contact your local council for further information. 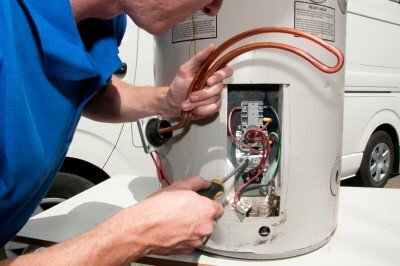 Whichever the outcome your friendly and professional plumber from 23 Hour Plumbing can provide you with advice on the most economical and efficient hot water heater to suit your home and lifestyle going forward and provide you with a free, no obligation, quote for the supply and installation. At 23 Hour Plumbing we understand hot water is a requirement in most Australian household’s and not something that you care to live without for long if you don’t have to. Therefore we are pleased to be able to offer our customers no interest EVER payment plans*, allowing you to have your new hot water heater supplied and installed TODAY without any financial pressure. Your electric hot water heater does not need to completely fail for you to get a new hot water system – why not take advantage of our interest free payment terms* and just upgrade to a better model today? Perhaps you moved into a new home and the current hot water heater does not meet your hot water heating demands? Perhaps you have an old gravity fed electric hot water heater and would like the luxury of stronger water pressure, rather than having to run around in your shower just trying to get wet! No matter the reason – 23 Hour Plumbing will assist. For no hot water, a leaking electric hot water heater, a burst electric hot water storage tank or strange noises coming from your electric hot water heater – contact 23 Hour Plumbing any time of the day or night on 1300 070 399. We are the electric hot water heating professionals in Adelaide, Melbourne, Brisbane, Perth, Sydney and Canberra and we guarantee to have a local plumber near you whenever you need us.